I found a perfect Father's Day Gift or a gift for any beer drinker or coffee/tea lover. Stainless Steel Beer Mug by Bar Brat is a really great mug. Constructed of Double Wall , air insulated 304 Stainless Steel, keeping your drinks hot or cold. 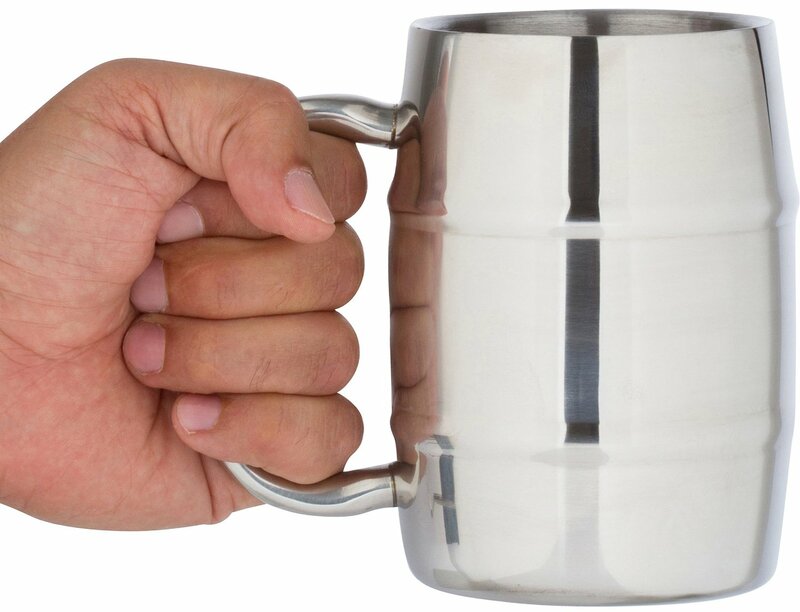 The handle stays room temperature no matter if your drink is hot or cold, and this mug never sweats. No need for a coaster. How awesome is that? I really like this mug for traveling too. It comes with an air tight lid for coffee, tea, soda, whatever you like to drink when travelling. No spills in your vehicle either. You can keep this mug in the freezer and it's dishwasher safe. It holds 16.0 oz., that's big enough for a beer leaving room for the head, or perfectly holds a can of soda. I think this would make a great gift or addition to your mug collection.